A few weeks ago, we showed you a 1950s view of Third Avenue, looking east from 17th Street. Today we return to Third Avenue as it appeared in 1910, this time looking west from 19th Street. Very few would recognize this scene today. Some of the prominent buildings are gone; others that we would readily recognize have not yet been built. Yet by noting those buildings and their construction history we can accurately date this rare “real photo” card we borrowed from Shannon Hall. Let’s start on the far left, at the southwest corner of the intersection, at the first YMCA building. It was built in the early 1890s and demolished in 1919. A July 2001postcard column featured that building. Now, of course, we know the corner as the home of Circa 21 Dinner Theatre, which took over the 1921 Fort Armstrong Theatre building. This, too, was the subject of another column in December of 2001. Beyond the YMCA, four second-story bay windows extend over the sidewalk. These were apartment windows on two identical buildings, each with two storefronts, that had been constructed mid-block around 1900. At the time this photo was taken, the easternmost building at 1816-18 Third Avenue held the Tri-City Morning Journal and a furniture store. By the 1940s, both storefronts were used by Eagle Kash & Karry Market – yes, the same Eagle Supermarket that existed in the area for many more decades. This building is still standing, although with one of its bay windows remaining. In 1910, its western twin at 1812-14 was the home of Blake & Murphy plumbers and Bauersfeld & Sexton Steam Laundry. The laundry continued in business into the 1950s, with Faigen’s Appliances using the former plumbing shop space. The building was demolished several years ago and is now a parking lot. Although we can’t distinguish it on the postcard, we want to point out the oldest still standing building in this scene at 1810 Third Avenue. It started its life in the 1880s as a blacksmith shop for Valentine Dauber, who advertised himself as a “practical and expert horseshoer.” When downtown didn’t need (or want) a blacksmith at its center, Dauber moved on and other businesses took over the building –a plumbing shop, a cigar factory, and, by 1911, a real estate office with a sign painting shop. In the 1930s it became a restaurant and many still remember it as the home of Orwitz Deli from 1950 into the 1980s. Today it serves as the home of Main Camera. Beyond, the “new” six-story Safety Building that had opened in 1908 rises above its neighbors. We easily recognize it today and it was covered in a 2001 postcard article in July. At the very center of the postcard, in the distance where Third Avenue bends, is a three-story commercial building that, in 1910, held Simon Lewis’ wholesale and retail liquor store on the street level and Hillier’s Hall on the third story. It was razed for hotel construction in 1964. As we move farther right on the postcard, returning toward the viewer, we see McCabe’s Department Store with a huge advertising sign painted on its side. Noticeably absent in 1910 are the two large banks that now stand on opposite corners of 18th Street. 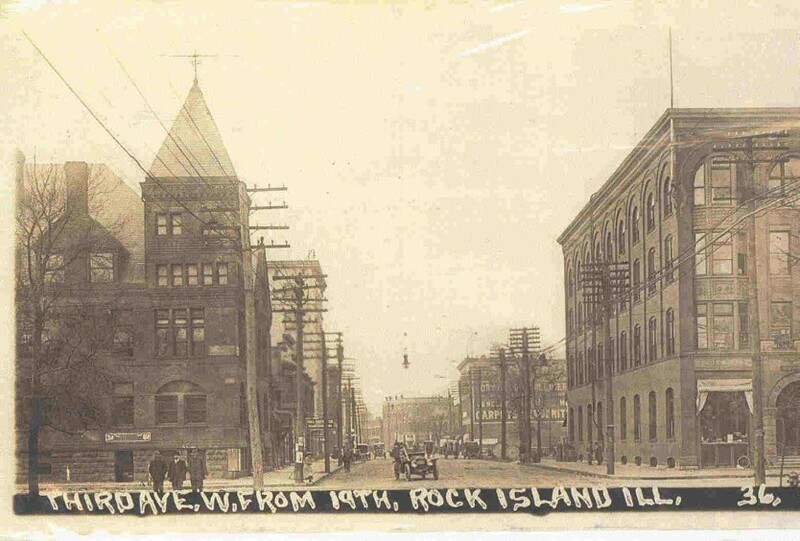 The farthermost Central Bank, now USBank, would not be built until 1914, while the Rock Island Savings Bank, now WHBF, was built in 1911. When we examine the postcard carefully, we can see construction equipment at that site. In the right foreground, the detailed styling of the large four-story pressed brick building belies its semi-industrial function. It was designed by local architect George Stauduhar as a warehouse for the Hartz & Bahnsen Wholesale Drug Company, the firm founded in 1890 by Ben C. Hartz and Frank W. Bahnsen. Collins Brothers contractors completed its construction in 1892. Its 44-foot wide front faced 19th Street and it extended 125 feet on Third Avenue. The office was on the first floor, as was the shipping department. The upper floors, all served by a hydraulic freight elevator, were devoted to orders, laboratory and manufacturing, and storage. Notice the arched openings in front holding shallow bay windows with decorative embossed metal beneath. The main entrance arch frames an elaborate wrought iron insert. The extensive use of arches in this building complements the architecture of the old YMCA, which was built about the same time. The Hartz & Bahnsen building had a rough time. In 1900, it was damaged by a basement fire which also destroyed the paint and oils stored there. A worse fire occurred in 1929, this time on the upper floor, which caused more extensive damage. Although the company announced their intent to rebuild, by the end of the year, they had reorganized and merged with their competitor to become McKesson & Hartz. The merged company, which located at 19th Street and First Avenue, would later be known by its national name McKesson-Robbins and, more recently has been converted to condos known as McKesson Lofts. The damaged building languished for years before finally falling to the wrecking ball. It was replaced around 1940 with the one-story building that stands there today. The Bahnsen name remained at the new Swan & Bahnsen Drugstore on the corner. We think this postcard is interesting because it shows how Third Avenue has lost some significant buildings, yet has gained at least two. And one thing we can all rejoice in – no longer do electric poles and wires obscure our downtown view. This article by Diane Oestreich, slightly modified, originally appeared in the Rock Island Argus and Moline Dispatch on November 17, 2002.